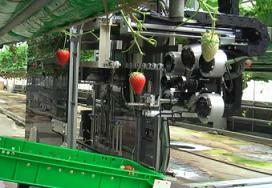 A Japanese robot has been designed that can select and pick the ripest strawberries automatically. I have been called the "Robot Defender" but since my cries have fallen on deaf ears I had despaired of ever raising the awareness of our coming demise. Our only hope is to implant our current strawberry pickers with cyborg implants to give them the edge they need to stave off the machines.